I've gotten several emails recently from family, friends, and blog friends alike asking what has worked for us in regards to baby things. Or, in other words, What should I register for? I am, by no means, an expert on this (and I was asking the same question just a few months ago!). But I'm happy to share what's worked for us for the past 4 months. Despite how long this list looks, I like to keep things simple. Other than a place to sleep, clothes to wear, diapers, and food, a baby just doesn't need very much. Nonetheless, here's what we've loved so far. • A carrier. We bought the Britax and were given a Boba wrap, and we like them both a lot. I know there's a debate about hip dysplasia for the Britax and an Ergo is touted as a better choice, but with the reading we did about it, it really wasn't all that concerning. Liam loves both carriers (and has had no problems with his hips). • Velcro swaddles. These have been life savers. We have this one in multiple sizes and colors. From the day we brought Liam home from the hospital, we'd swaddle him tight, kiss him goodnight, and put him to bed on his back. Once he began to understand the routine and that it was bedtime when we did this, he slept longer and longer and began sleeping consistently through the night (7 hours or longer) at 6 weeks. We've tried having him sleep without it, but he ends up swatting himself in the face and waking up. And if we just use a blanket, he's out like a ninja in about 30 seconds. • A sound machine. We have this one and love it. It's been turned on in the nursery since we got home from the hospital. • A portable swing or bouncer. We have this one. It's light enough to move around the house (or take to Mimi & Poppy's house) and he's loved it since day 1. I also like that it's soft colors so it goes with our decor. :) He gets a little antsy in it now, but it was very useful for the first 2-3 months. • A boppy and cover. This helped me so much as I was learning to nurse - especially in the hospital - and it makes a great baby shower gift. • A carseat/stroller system. We have this carseat that works with this stroller. We love both of them and our main reason for choosing this specific stroller was that it can eventually adapt into a double stroller, so it'll last us a while. The only downside is that it's super heavy (as is the carseat), but I'm not sure these kinds of strollers or carseats come any lighter. Otherwise, we love it - it glides smoothly and is great quality. • Diapers and wipes. You can't have enough! Even if you plan to go the cloth route, newborn diapers are so helpful because they go through 8 to 10 or more every day at the beginning, so it helps to have a big stock. • A bed/bassinet for before the baby moves into his/her crib. We didn't have a plan for this until Liam was born, so the three of us ended up at Target when he was 48 hours old looking for a solution (oops!). This is the one we found. We didn't use it on our bed, but right beside the bed on the floor. It worked perfectly for the first few weeks before we put him in his crib, and even worked well a week or so ago when we took a road trip to Ohio. • A play mat/baby gym of some kind. We were given one and he has loved it and spent hours playing with it. It's nice to keep him occupied and stimulated. I guess I didn't really think to register for baby toys because they seemed so far off, but the time that he can use them comes earlier than you think! • A rocker. We found this one at a great discount (ours was even cheaper as it was the floor model) and have loved it. • Clothes. 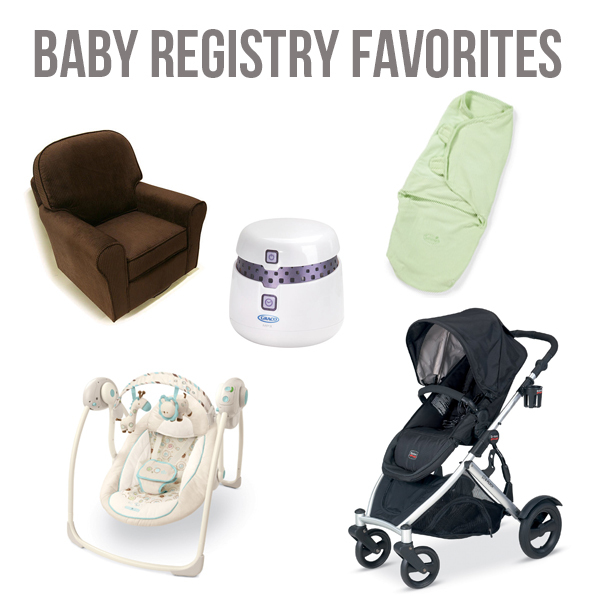 You'll get so many (and many that are not very practical), so I would probably save the registry for things you may not get unless people are prompted. OH! Also... lots of you were so, so helpful in giving advice for what to register for. So if you want to look through the comments on this post, there are many helpful ideas! I'd totally agree with about 98% of your list (we never used a sound machine). I also wish that I'd included more bottles -we use Avent Naturals and LOVE them- and extra sets of pump parts. There are plenty of times where hubby gives Isaac a bottle of pumped milk and washing bottles/pump accessories every day or two (because we only have a couple) is a chore. Yes! A second set would have been woooonderful! Agree with your list 100%! Just thought I would add one thing to the swaddle issue, we had a hard time trying to unswaddled our little man and tried a zipadeezip. You can find her product here...zipadeezip.com. It has been a lifesaver!!!! In case you needed a transition!!!! Love your posts! We have that same rocker an the ottoman. Love it and am secretly looking forward to baby #2 being big enough I can sneak the chair to my bedroom a a reading chair. So comfortable! YES. We will love this chair forever and ever. It's amazing.